There are a couple of options…. The Mountain Bike Manky is a cool fabric forest map or …map on a hanky! Made of micro-fibre the Manky is durable, legible when wet, can be washed and dried, is absorbent, anti-bacterial, eco-friendly and totally re-usable. And you don’t need an origami degree to fold it. It can be stuffed in your bag or pocket or tied around your bike’s handle bars. And at the end of its life as a map you can use it to clean the windows! The Manky is just right for those who want something easy to carry and who need a convenient navigation tool. It’s got a full forest mountain bike map on one side and an enlargement of the core tracks on the other. Regular retail price is $22.50. Also available at the Redwoods is a paper version of the Manky. This is great option for a one off visit or as a cheap souvenir. Light weight and easy to handle being A3 in size. Exactly the same info as the Manky but in paper. Regular retail price is just $5.00. There is a free walking map available from The Redwoods which has all the walk track options. You probably don’t need one for the shorter tracks but if you are heading out a bit further it pays to have one at hand. 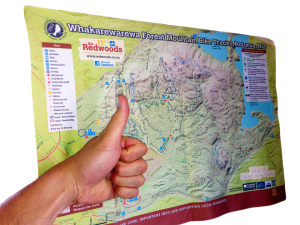 If you need a Manky or a map – they’re available now at Mountain Bike Rotorua at the Waipa entrance or The Redwoods Visitor Centre and I-Site at The Redwoods entrance. Contact The Redwoods prior to your visit to arrange delivery click here. By purchasing a Manky or Map you are supporting maintenance of the tracks and facilities in the forest. Remember entry to the forest is FREE. Don’t forget to call in and see the friendly staff at The Redwoods Visitor Centre and I-Site or at Mountain Bike Rotorua who can offer great advice and provide you with vital information on forestry operations, forest safety, closures, track maintenance and diversions.